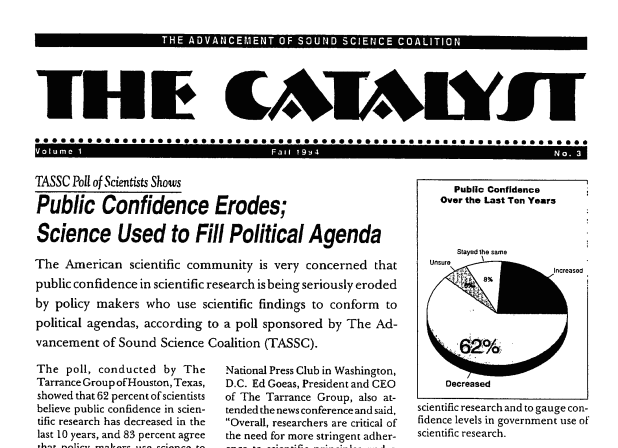 This is a 1994 newsletter from The Advancement of Sound Science Coalition (TASSC), an industry-funded front group created in 1993 to create doubt about the health and environmental risks of tobacco. The group was a front for Philip Morris, the world’s largest tobacco company which controls about half of the U.S. tobacco market. Pingback: Does the grass get greener when a ‘lukewarmer’ is in your backyard?